A perfectly spicy vegan black bean dip, great for your next party or potluck! Chock full of black, beans, garlic, and a hefty dose of your favorite salsa. This post is sponsored by USA Pulses and Pulse Canada. Thank you for supporting the brands that make this space possible! You know what I love most about Super Bowl weekend? Obviously, the snacks! I actually understand football about 40% more than I used to before I met my husband, but I’m not a superfan by a long shot. I can pay attention for a while, but honestly, when we all gather on a Sunday afternoon at a friend’s house, you can usually find me hovering around the snacks. This year, I’ll be hanging out by the spicy vegan black bean dip and eating through all the tortilla chips. One of the BEST things about bringing this spicy vegan black bean dip to the party is that it’s most likely going to prevent that post-snack crash and is packed full of plant-based protein and fiber. I also love bringing black bean dip into a party because it’s something almost everyone loves and it tastes delicious. It’s like a sneaky super healthy snack that is good for your gut and your waistline. Win! Case in point, you can find me by the black bean dip. I usually am the purveyor of the desserts at a party. 9/10 times I’m bringing a Tupperware full of cookies or a cake leftover from a blog shoot, so I won’t run the risk of eating it all myself. But, this year I’m going savory! I’ve partnered with USA Pulses and Pulse Canada to up your pulses game and incorporate a little more healthy balance into your game day snacks. Personally, I know I don’t take advantage of all the nutritional benefits of pulses enough, which include chickpeas, beans, and lentils and am using their Half-Cup Habit to motivate myself to cook even more with these nutritional powerhouses. If you want in on packing more even more pulses into your diet (just ½ cup 3 times a week! ), sign up for their Half-Cup Habit with me! 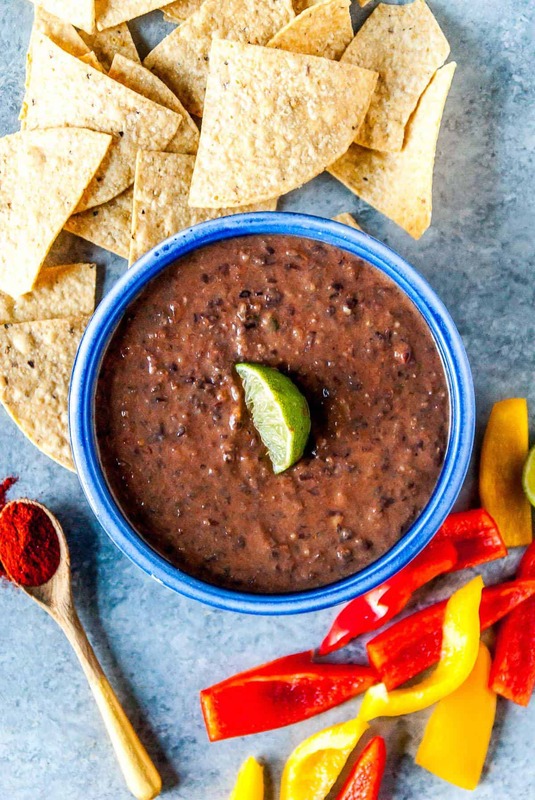 This spicy black bean dip uses just a handful of ingredients, including black beans, salsa, lime juice, and a handful of spices. To make this black bean dip, you first need to blend all the ingredients in a food processor, except for the salsa and lime juice. Pulse the ingredients until smooth, but leave a few chunky black beans in there! Transfer the blended black bean mixture to a small baking dish and then stir in the lime juice and salsa. Bake the vegan black bean dip for 20 minutes, or until it starts to bubble and is heated through. Serve the dip immediately while it’s still warm, and dig in with your favorite tortilla chips, veggies strips, or crackers. To jazz up this vegan black bean dip, sprinkle on your favorite vegan cheese or dollop some vegan sour cream on top. Preheat oven to 350ºF. Lightly grease a loaf pan or small square pan and set aside. In a food processor, combine all the ingredients except for the lime juice and salsa. Pulse until combined but black beans are still slightly chunky. Transfer dip to the prepared pan and stir in the lime juice and salsa. Bake for 20 minutes, or until dip is bubbling and warm. Serve immediately with tortilla chips and bell peppers. Do you drain the can of beans or put the liquid in the food processor too? Drain the beans before putting them in!